Statistics current as of August 6, 2017. Boris Said III (born September 18, 1962) is an American professional race car driver. His father, Bob Said, was a Formula 1 race driver and US Olympic bobsled driver in 1968 and 1972. His NASCAR career began in 1995 as a "road course ringer" primarily due to his extensive road-racing experience. He last competed part-time in the Monster Energy NASCAR Cup Series, driving the No. 33 Chevrolet SS for Circle Sport – The Motorsports Group. Said's early interest was in motorcycle racing. In 1985 while attending the Detroit Grand Prix as a spectator he met SCCA Champion, Bob Sharp. He began racing with the SCCA in 1987. Said was named SCCA rookie of the year in 1988. In 1991 he began driving for Baer Racing, later to become Baer Brake Systems. Upon Baer's withdrawal from the series to focus on the manufacture of brakes in 1992, Said got another big ride driving in the IMSA series in 1993 driving a BMW M3. He won the 1997 and 1998 24 Hours of Daytona and 1998 12 Hours of Sebring in IMSA. He also became the first American to win the 24 Hours Nürburgring in 2005 driving a BMW Motorsport-entered BMW M3 GTR with co-drivers Pedro Lamy, Duncan Huisman and Andy Priaulx. Said made his NASCAR debut in 1995 in the Craftsman Truck Series at Sears Point International Raceway, driving the No. 4 Ford F-150 for Irvan-Simo Racing. He started 25th and finished 24th out of a 26-truck field due to overheating problems. He made three starts the following year driving Irvan's No. 28 1-800-Collect Ford, his best finish was thirteenth, at I-70 Speedway. Said moved to trucks full-time in 1997 in the No. 44 Federated Auto Parts Ford. While his amateur season did not yield any wins, he finished second at the Pronto Auto Parts 400K and finished sixteenth in the final standings. Said received notice from fans and drivers when he contacted championship contender Rich Bickle at the 1997 October Sonoma truck race. Bickle had blamed Said for causing him to lose a top five running, and made contact that cut down Said's tire. In reply an angry Said waited for Bickle to come back around and retaliated. Both drivers apologized the next day. Said was fined $15,000 and was suspended until he paid the fine. The following year, he won his first career truck series race, at Sears Point, in addition to his first truck pole, at Heartland Park Topeka. He also made his Busch Series debut, at Watkins Glen International Raceway, starting on the pole but finishing 40th in the No. 12 Zippo Chevy owned by Jimmy Spencer. In 1999, Said scaled back on his truck series schedule, running only six events. He won poles at Portland and Topeka for Irvan-Simo, as well as driving for Team Racing and Bobby Rahal. He made his Winston Cup debut, at Watkins Glen, qualifying on the outside pole and leading nine laps before his No. 14 Ford suffered engine problems. He also drove at Homestead-Miami Speedway, finishing 34th. In 2000, he made what would be his final truck series start for five years, at Portland, finishing fifteenth. After a 30th-place run at California Speedway, he returned to the Cup Series, driving the No. 23 for Jimmy Spencer, and finished 42nd at Sears Point. He also attempted the Cup race at Watkins Glen, but failed to qualify due to a lack of owner's points. He saw limited action in 2001, finishing fourth in a Busch Series race at Watkins Glen in a Robbie Reiser-owned car, and drove a pair of races for Jasper Motorsports. He could have won the 2001 Global Crossing at the Glen. While running third on the final restart, Said tried to make a pass by Jeff Burton to try to take the lead from the dominant car of Jeff Gordon but got held up in traffic, causing him to slip back to 8th place, scoring his first top ten of his Cup series career. After running with Jasper again in 2002, Said served as a fill-in driver for Jerry Nadeau at MB2/MBV Motorsports. He won the pole for the Sears Point race in California. He stayed in the top ten all race. With pit strategies, it seemed like the win would come down to Said and fellow road ace Ron Fellows. However Said and Fellows forgot to pit when they were told to before a caution came out. Because they did not pit before the caution with 38 laps to go, Said and Fellows lost their shot at the win. Said restarted 26th and recovered for sixth place. Said signed on to drive a limited schedule for the team in 2004, running the No. 36 Centrix Financial Chevrolet, and finished sixth once again at Sears Point. The team expanded to run more races for 2005, where his best finish in nine starts was a third at Watkins Glen. During that season, he returned to the truck series finishing 35th at Kentucky Speedway while filling for an injured Rick Crawford. He also ran two races in the Busch Series for Phoenix Racing, and had a fifth-place finish at Autodromo Hermanos Rodriguez in Mexico City. Said joined Evernham Motorsports to help the team's road course program in 2006. He won the pole at Mexico City, and finished second, as well as driving the No. 4 Geico Dodge Charger for Biagi-DenBeste Racing at Lowe's Motor Speedway, starting 40th and finished 31st. In May 2006, Said and his crew chief Frank Stoddard and Mark Simo announced the creation of No Fear Racing, which used equipment from Roush Fenway Racing. They ran four Cup races starting with the Dodge/Save Mart 350 at Infineon Raceway. He won the pole at the Pepsi 400, his first Nextel Cup pole on an oval, in one of the biggest upsets in Daytona history. Following his pole win, he promised a pit reporter that if he either won the race, the race at Watkins Glen International or an NNS race within three years, that he would shave his head, come to the channel the next week and show everybody. He was leading the race with three laps to go and was passed by his friend Tony Stewart; after two more laps he finished fourth, his highest career NASCAR finish on an oval track. In a post-race interview Said emotionally said his performance in the Pepsi 400 was "the highlight of my career". At Watkins Glen, Said had originally finished sixth but hours after the race was over he was moved from sixth place to 31st place by officials due to a scoring error. Years later, it was revealed that Said and fellow road course ringer Ron Fellows had been given a 30-second penalty each for having made illegal passes through the inner-loop on the final lap. Said qualified and ran in the 2007 Daytona 500. Although he was not in the top 35 teams from the 2006 owner's points, Said posted the fastest qualifying time among non-locked teams and the sixth fastest qualifying time overall. Starting in 23rd position, Said dropped back to last place near the beginning of the race and had no hope of regaining enough speed to finish well. However, he got a good finish when he managed to avoid a massive crash at the finish and cross the line in 14th place, behind winner Kevin Harvick. 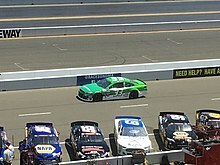 Said finished ninth at Sonoma but failed to qualify at Daytona and Watkins Glen due to rain. Said failed to qualify for the 2008 Daytona 500 but had a productive NNS series. 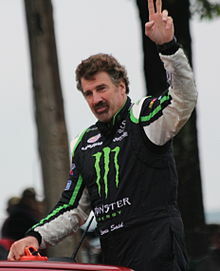 Following an incident with Marcos Ambrose at Mexico City that wrecked his car, Said angrily wagged his finger at Ambrose when he passed by to lap him down. Said initially vowed payback against Ambrose but he ultimately moved forward. Said came back and finished 5th in Montreal that year. No Fear Racing closed after the 2008 season ended and it merged with Carter Racing. Said qualified the race at Infineon in the #08 Carter-Simo Racing machine. Said drove the No. 26 for Latitude 43 Motorsports in 2010. He also announced a one-year deal to drive the No. 09 Zaxby's NNS Ford for RAB Racing in the Nationwide series Road Course events. He ran the first four races and Infineon. His crew chief, Frank Stoddard was livid with Tony Stewart for contact on the final lap of the Infineon race and confronted him in the garage, but Said did not take part in it and apologized for his team's behavior the next day. The cars used were former Roush Fenway Racing Fords and the team, which finished 22nd in 2009 and was sold to satisfy NASCAR's four cars per team rule, had exemptions for the first five races of 2010. By August 2010, Said stated that he did not expect to be back with Latitude 43. Said received a one-race deal from Team Red Bull at Watkins Glen to replace ill driver Brian Vickers and had a good run. In the ending laps he made contact with Stewart that took him out of contention to win. When interviewed Said said it was just a racing incident that was unavoidable. Meanwhile, Said had a successful NNS season. 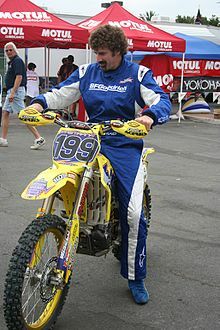 On August 29, 2010, Said led the rest of the race after Robby Gordon ran out of gas with three laps to go, and won his long desired first NASCAR Nationwide Series race, at the Circuit Gilles Villeneuve in Montreal. His close friend, who he had raced with in F1 and NNS before, Italian driver Max Papis, passed him in the final turn to try to win, but a mistake by jumping over the curb too high cost him the win. Said passed Papis after the mistake and they raced to the finish. By the time they reached the line Said was a bumper ahead of Papis (The finish resembled the 2009 Montreal finish, where Australian driver Marcos Ambrose dominated, but made the same mistake Papis made, handing the win to Carl Edwards). Said publicly shaved his curly hair and received applause when he received TV attention for his victory. I'm more upset with Greg Biffle, he is the most unprofessional little scaredy cat I've ever seen in my life, he won't even fight me like a man. So if someone texts me his address, I’ll go see him Wednesday at his house and show him what he really needs. He needs a friggin’ whooping, and I’m going to give it to him. He was flipping me off, giving the finger, totally unprofessional. Two laps down, I mean, he's a chump.... I went over there to go talk to him and he wouldn't even let me get out of the car and he comes over and throws a few little baby punches, and when I get out, he runs away and hides behind some big guys. But he won't hide from me long, I'll find him. I won't settle it out on the track - it's not right to wreck cars - but he'll show up at a race with a black eye one of these days. I'll see him somewhere. The incident was investigated by NASCAR officials, but no penalties were given. Said received a late call up from Turner Scott Motorsports to run the 2011 NAPA Auto Parts 200 Nationwide Series race in Montreal in the No. 30 Great Clips Chevrolet. In 2012, he teamed with FAS Lane Racing to contest the races at Infineon Raceway and Watkins Glen International. Said ran the Sprint Cup Series road courses in 2012 for FAS Lane Racing. Said continued to run for the team in 2014, now renamed Go FAS Racing. For 2015, he ran the road courses for Go Green Racing in the No. 32 Ford Fusion. At Sonoma, he finished 26th. In early March 2015 Said was picked to drive the No. 54 Monster Energy drink car in the Xfinity Series for Joe Gibbs Racing, substituting for an injured Kyle Busch. Said raced at Talladega, both Iowa races, Chicagoland, Mid-Ohio, Road America and Kentucky in the 2015 season. At Talladega during the Aaron's 312, Said ran as high as second but as the race got competitive during the final 25 laps, he finished 16th. At Iowa, Said brought home a top-24 finish. Because Busch returned earlier than expected, Said was not needed for the Chicagoland races and the next Iowa race. However Said was called on to replace Busch during the three road course events including the Zippo 200 as Busch withdrew from that race to continue his healing process of his leg. His best finish in the No. 54 was a fourth at Watkins Glen during the 2015 Zippo 200. Said did not enter the 2016 Toyota/Save Mart 350, missing the Sonoma race for the first time since 1999. However, Said did return to the No. 32 team at Watkins Glen in August for Go FAS Racing and he would finish 24th. With Go FAS Racing hiring Matt DiBenedetto, Said was left out of the #32 ride for 2017. On June 20, 2017, Said announced that he would drive the No. 33 Chevrolet SS for Circle Sport – The Motorsports Group for Sonoma, replacing Jeffrey Earnhardt. It is the first team Said has driven for in the last 5 years other than GFR. He ran as high as 12th at Sonoma and finished 29th. Later that season, Said announced during the week of the Watkins Glen race that the 2017 I Love New York 355 at The Glen would be his final NASCAR race. He closed his NASCAR career with a 30th place finish. Said competed for the PTG Racing Group in the 2000 season driving a BMW M3 in the GT category, and managed to win at Laguna Seca. The PTG Team finished third overall in the GT category that year. Said was listed as a driver on the 2011 24 Hours of Le Mans LM GTE Am class entry of Robertson Racing. Said was entered into round nine of the Australian V8 Supercar series, the L&H 500 at Phillip Island, Victoria, that took place on the weekend of 12–14 September 2008. He drove the No. 67 Supercheap Auto with Matt Neal. They finished the race in 19th. This deal also included racing at the 2008 Supercheap Auto Bathurst 1000 at Mount Panorama Circuit near Bathurst, New South Wales. This took place from the 9th to the 12th of October, 2008 and was by far the largest event on the Australian touring car calendar. Said failed to finish the race after his teammate Matt Neal crashed the car. He returned to the category to drive alongside Steve Owen in the 2011 Armor All Gold Coast 600 with Paul Morris Motorsport, finishing in 18th on Saturday and seventh on Sunday. Said has competed in the X Games twice. He was invited as an "at-large" rally car entry for the X Games XIII at the Home Depot Center in Los Angeles, on August 5, 2007. Said was joined by American rally car racing legend John Buffum as his co-driver. Said returned to the X Games at Austin in 2015, competing in the Speed Energy Formula Off-Road category. Said finished fourth of five trucks in his heat race, and was forced to contest the last-chance qualifier; he finished fourth in the LCQ, and missed the final. ^ Martin, Bruce (July 24, 2012). "Popular Said Bringing Diverse Talents To Brickyard Grand Prix". Indianapolis Motor Speedway. Retrieved 2012-08-11. ^ Courchesne, Shawn (April 22, 2008). "Marcos Ambrose - Boris Said Feud Continues On". Hartford Courant. Archived from the original on July 1, 2013. Retrieved April 30, 2015. ^ "NASCAR Sprint Cup driver Boris Said threatens to 'whoop' Greg Biffle after monster smash". Archived from the original on 2012-12-30. ^ "Boris Said, Greg Biffle tangle after race". ESPN.com. 2011-08-16. Retrieved 2015-01-18. ^ "Boris Said on Greg Biffle". August 19, 2011. ^ "Hendrickcars.Com To Sponsor FAS Lane Racing". SPEED Channel. Fox Sports. June 4, 2012. Archived from the original on June 6, 2012. Retrieved 2012-06-08. ^ DiZinno, Tony (June 20, 2013). "NASCAR's Sonoma 2013 road course ringers, analyzed". NBC Sports. Retrieved June 20, 2013. ^ "Travis Kvapil to join Terry Labonte and Boris Said as drivers for Go FAS Racing in 2014". Catchfence. February 21, 2014. Retrieved February 23, 2014. ^ "Drivers Confirmed to Pilot No. 54 Monster Energy Toyota in Upcoming NASCAR XFINITY Series Events". Joe Gibbs Racing. March 3, 2015. ^ Long, Dustin (June 20, 2017). "Boris Said to race at Sonoma for Jeffrey Earnhardt". NBC Sports. Retrieved June 20, 2017. ^ Spencer, Lee (August 3, 2017). "Boris Said to make final NASCAR Cup start at Watkins Glen this weekend". Motorsport.com. Motorsport Network. Retrieved August 3, 2017. ^ "V8 SUPERCARS - Race 21". Archived from the original on 2012-09-06. ^ "V8 SUPERCARS - Race 22". Archived from the original on 2012-09-07. ^ "Boris Said to Race Off Road Trucks at X Games". K1 Speed. May 14, 2015. Retrieved May 27, 2015. ^ "Off Road Truck Racing". X Games. Retrieved June 18, 2015.